My Bargain Basket: FREE - 2 bowls of Single Serve Cherrio's! Get your coupon for $1/1 Cherrios (IE or Firefox) *use your back button to print twice. 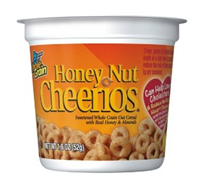 The coupon is good for Honey Nut or Origional Cheerios. Since there is no size restriction, you can score a couple of free bowls. Target has single serve Cherrio's for $1. You could also check CVS, Walreens, or other grocery stores. Here is another source for $1/1 Cherrios coupon here (use your back button to print twice). This is for Origional Cherrios only.